Dr. Raye Mitchell is a social entrepreneur working to change the way change is made. She is an award winning humanitarian and both a trainer in the field of leadership as a social entrepreneur leadership and a practicing social entrepreneur as the Chief Social Entrepreneur (“CSE”) of The New Reality B-Corp, a California benefits corporation. (“NRB”) a Certified Social Impact Enterprise™, a boutique legal and business firm providing expertise and services for social entrepreneurs and social impact ventures. She is a graduate of Harvard Law School, the University of Southern California (USC), the USC Sol Price School of Public Policy (B.S.) and the USC Marshall School of Business (MBA). She is a native of Los Angeles, California. I have considered myself a storyteller and writer all my life in one form or another. In spite of this, a different question is when did I decide to go public with this passion and persistent drive to be a writer of non-fiction and fiction works and why? As a marketing and branding professional and litigation attorney in the entertainment industry, I was always involved in persuasive writing, storytelling and trying to get others to listen to the stories of my clients. But, several years ago, my inside voice that craved to be a writer succeeded in overtaking my outside voice that consistently focused on perfecting my skills as an entrepreneur, businesswoman, and an attorney. Upon reflection, it is now clear that I had been fully engaged as a creative writer all the time by merging my professional commitment to advocating, justice, and fairness by writing about my experiences with the civil justice system and persuading juries to return justice for my clients in situations of injustice. I think I have evolved creatively by honing my craft as a writer in multiple sectors by and expanding my creative decision-making zone-which is my way of saying I have permitted myself to write. outside of my comfort zone. I am always yearning to learn how to write better and how to take unique writing skills from one sector and apply to another. It is my way of shaking myself up to find a new perspective on a familiar storyline. Yes. I went public with my creative writing projects in about 2010. I gained my courage when I was so humbled and yet inspired by my humbled encounter with an apparently homeless woman, Margie, I began assembling a collection of words of self-respect and success from notable female role models, past and present and produced an anthology based on quotes to inspire and inform. The story of Margie first appeared in my first significant book entitled, The Evolution of Brilliance: Voices Celebrating the Importance of Women“. I stopped, and for the first time that night, I looked into Margie’s eyes and made a personal connection, realizing that she may have just been trying to advance her life utilizing the only tools she had at her disposal. I said, “You know, you are right. What help do you need?” All Margie wanted was prayer and the chance to be counted as a person in this world as she strived to rebuild her life. Even though I was a stranger and she knew nothing about me, I was humbled that she entrusted me with her simple request for help. Margie’s story and my decision to be a published writer thus came to life in 2011. I turn to my writing to tell stories about experiences and stories that sometimes you just want to share with God because God has no judgment. I want to write stories about our experiences as Black women and girls being judged and how we deal with that burden and opportunity to rise above the judgment. My writing has helped me be a better person. My quest to shift gears from being a full-time entertainment attorney with my law firm to being a full time humanitarian and writer has not been easy. I thus began translating these challenges, hurdles, setbacks and disappointments into my creative energy to tell the story. I then discovered the personal power of telling the story, no matter how difficult the journey. My writing has transformed my sense of well-being and wellness. My writing has also helped me find another way to merge my passion for helping others, especially women and girls with my technical skills as a writer, storyteller, and even a persuader. Author, entrepreneur, and brand creator Quentin Holmes (known to his friends as Q) has dedicated his life to empowering the world’s youth through trendsetting literature, media, and fashion. The son of a hardworking father whose career advancement moved the family to nearly every region of the country, Quentin gained exposure to people from a wide range of different social, economic and racial backgrounds. In the end, the family’s economic status was greatly improved and the Holmes children were afforded opportunities that previous generations did not have. Rooted in a family tradition that valued education, Quentin earned a bachelor’s degree in Mass Communication from the University of Michigan. Taking classes and socializing with young people from all over the world enriched Quentin’s already well-rounded perspective of social diversity. Suburbanites, children of farmers, inner city kids, and people from Third World countries were all striving for the same goal of a college degree. Likewise the main characters in Johnny Skip2 and Sporty Lou bring vital multicultural characters to life, but this time for his younger readers (ages 3-6). Both picture books; like their Real Street Kidz predecessor, diligently seek to inspire, embolden, and entertain a brand new generation of children. “LongTALES for ShortTAILS” is a children’s short-story collection that totals sever interesting stories. To date, Duane Lance Filer has completed and self-published three of the stories in the series. The stories are about real and imagined stories that kids from 2 – 13 years-old will enjoy. “LongTALES for ShortTAILS,” written by Duane Filer, that will leave your kids enthralled and excited. Each book contains eye-popping color illustrations by Jay DeVance III. Below is a brief summary of these three storybooks. Please share this flyer with your friends and family. Give the Gift of Knowledge…Give Books as Gifts! Fastjack was coming to spend the summer with his grandrabbits- Grandpaw and Grandmaw Robinson, in Bunny Junction. Fastjack Robinson had moved to Hare City, but always loved coming back home to visit his beloved grandrabbits as well as his childhood friends House Mouse and Stooley the Pigeon. After a big welcome-home supper of carrot stew and rabbit tea, Fastjack was informed by the squeaky voiced House Mouse that the notorious, mischievous Grabbit Rabbit was wreaking havoc in Bunny Junction by stealing pies and other carrot items from the families in Bunny Junction. Little did the Grabbit Rabbit know that, like a young Jackie Robinson, Fastjack Robinson was the fastest rabbit in the world! Somebody in Bunny Junction had to stop the notorious Grabbit Rabbit. So Stooley, House Mouse, Grandpaw, and Grandmaw devised a plan to catch the Grabbit Rabbit. It’s Fastjack to the rescue! Follow along as Bishop, oldest child of the Morrow household, learns the ins and outs of owning and taking care of a dog. Bishop has daily duties of feeding and caring for Ms. Missy; bathing her in the Morrow backyard with younger siblings Maxine and Kelvin; and training Missy in the ways of the pet and human world. Time passes, as both Missy and the Morrow family grows with additional kids. One day, Missy disappears, and young Bishop feels it is his fault because he scolded Missy too hard. Bishop feels terrible, and fears she has run away for good. When Missy is finally found, she has a surprise of a lifetime for the Morrow family! The year is 2050. The space shuttle to the moon has been a reality since 2030. There have been scientists, explorers, politicians, entertainers and celebrities; just about every type of scientific type person has been or has plans to go to the moon…but no ordinary people have been included? Black, white, brown, or yellow…no regular ordinary people have been to the moon. Finally, in 2050, the USA government has decided it is time to send some regular folks to the moon. A contest was held to pick three lucky souls to be sent to the moon. Each person selected could bring a friend. And the best part is that the government claims once the lucky winners get to the moon, there would be a surprise waiting for them. 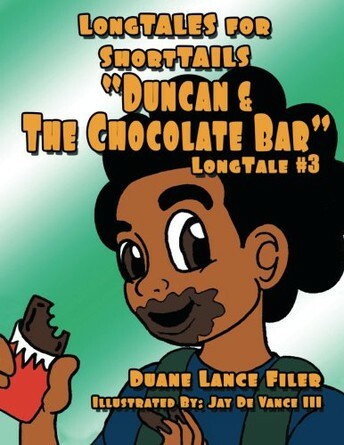 Purchase Duncan & the Chocolate Bar by Duane Filer. BPM: Tell us about your most recent work with children’s literature. Available on Nook and Kindle? 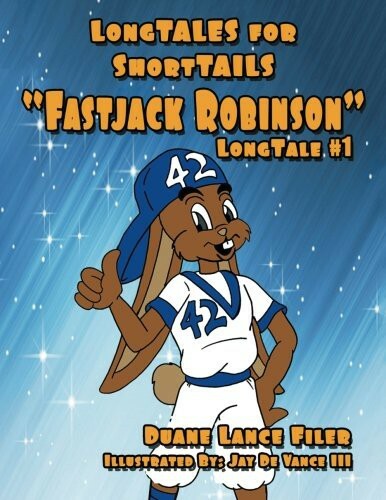 • Fastjack Robinson – Like a young Jackie Robinson, Fastjack is the fastest rabbit in the world! Somebody in Bunny Junction has to stop the notorious Grabbit Rabbit, so it’s Fastjack to the rescue. 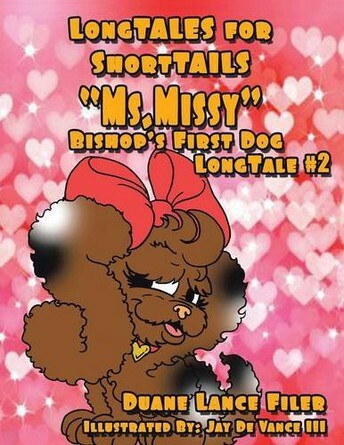 • Ms. Missy-Bishop’s First Dog – Do you remember what it was like when you got your first dog? Bishop’s first dog turns out to be the beautiful diva Missy. Plus, Missy soon has a surprise for the family. • Duncan and the Chocolate Bar – A story of the futuristic Duncan as he wins a contest and is one of the youngest to ever travel to outer-space. The storyteller is back! It’s been two years since Jasper’s Café on the Boulevard was released, and the time away has served Tracey Fagan Danzey well. This natural storyteller has returned with a punch delivering a strong story that blends humor, drama, action and of course, unforgettable characters. A View From Harlem centers around Harlem Brooks, a handsome, successful lawyer with no interest in settling down with one woman. It appears that Harlem has life in the palm of his hand until an unexpected discovery about his family leaves him questioning everything he holds dear. But it doesn’t stop there! In true storyteller form, Tracey has woven in several engaging plotlines that deal with love, faith, loss, infidelity and redemption. Tracey’s characters both supporting and main come to life and have you feeling like you’ve known them forever. (Trust me when I say that you’re going to want to invite Aunt Dot to Christmas dinner!) If you’re looking for a modern read that seamlessly has you laughing one minute and wiping away a tear the next then the View From Harlem is one you won’t want to miss. Sitting there with the pieces of your life around you, there seemed to be a pattern. There was faith, love, deceit, lust, and loss—in that order. You didn’t think you were deserving of love. That is why everything was being taken from you, and you were ready to give up on life. Through your poetry, faith, and learning from your past, you can rewrite the story. It was after coming through all the experiences and being stronger, you realized there is always a new chapter. There Is Sunshine After the Rain will take you on the journey of a young girl growing up in Connecticut, who had to take some stumbles along the way to come into her own and realize instead of tearing herself down for the decisions she made, there is a lesson. There were men who came into my life that I loved with all my heart over the years. One man after another disappointed me for specific reasons. I found some had wandering eyes, cheated on me with my best friend while I was away at school, or I found out that they said all the right things, but their actions spoke another. Something in his tone let me know that it was the right decision because I needed to become independent. I had family in California, so I had support. Within two months I had given notice at my job, packed two suitcases, sold my belongings and had a one-way ticket to California. I knew no one except my family, and I slowly began to venture out to the unknown. I was working sometimes two jobs to make ends meet. Because I couldn’t go back to Connecticut. Because I didn’t want to fail. My father’s health was declining and I would come back annually to see him. I had so much excitement to see him that I would just lie on the covers next to him. Just listening to him breathe and feeling protected from the storm. I remember like it was yesterday I came home after he had surgery. It was snowing and I went outside to shovel the snow. Being that I was the youngest, a girl, and my parents always paid a neighborhood kid to do this. Well the kids had all grown up and moved out of the neighborhood. I never had done this task of shoveling. Something that my father had done for years and made it seem like the snow was as light as a feather. He sat and watched me and I struggled, but he stayed in the window from afar. It felt like the muscles within my chest had exploded and I was in so much pain, but I couldn’t let my parents down. I thought I had done a good job. While I was inside recovering from the ordeal, my father had changed clothes and slipped outside. Shovel in his hands and as the man of the house—no matter if he had a hole in his side, wasn’t to lift anything, and was supposed to be recuperating—he was still going to be the man and complete the task. Patricia Anne Phillips currently resides in Los Angeles, California. She has written eight novels, Romance and Women Fiction and is now working on her new novel. Website address: http://www.patriciaannephillips.com.